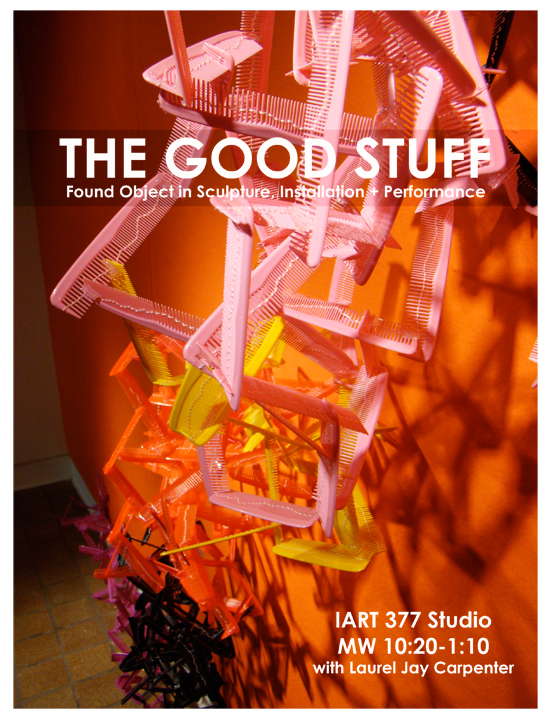 Through object experiments and spatial investigations in this studio course, students examine the fundamental techniques of found object artwork, using accumulated or altered mass-manufactured objects in hybrids or series to create personal work in the disciplines of sculpture, installation and/or performance. Through research and hands-on experimentation, students will have an opportunity to further appreciate how material, space and intention cooperate to form three-dimensional art. Direction of the course will be lead by student interest and may include traditional assemblage sculpture, site-specific installation and prop-driven performance art, with attention paid to the interaction and collaboration often called upon in large-scale work. Slide presentations and discussions about contemporary art will further explore the historical, cultural and popular aspects of the found object. This entry was posted in SPRING 2011 on March 25, 2011 by ruralscape.